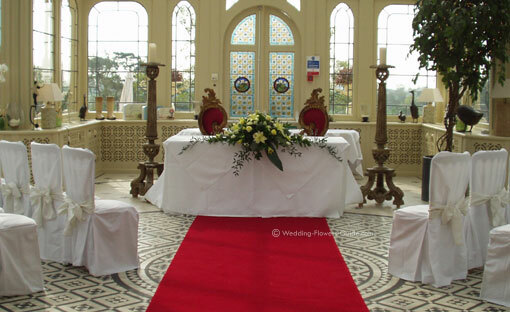 How do you personalise a church or civil ceremony room to reflect your tastes? Easy, just install some beautiful wedding ceremony flowers! If the church is large you may want to make a big bold statement with one or more large pedestal arrangements. Place these where they will be noticed such as the entrance to the church, or at the front close to the altar. Make use of window ledges, and other natural places to lay flower arrangements. The picture above was taken at a wedding we did in a historic fifteenth century church. It features pink roses and gerberas, lilies, veronica and snapdragons (antirrhinums). You can also place arrangements on the altar. I like to check with the vicar or minister that this is OK first. Altars suit 'long and low' arrangements. Pew-end flowers ( as shown in the photo above) can provide an attractive decoration, and will look fantastic to the bride as she walks down the aisle. If your budget won't stretch to decorating all of the pew-ends, place flowers on the ends of just the top two pews closest to the altar. Garlands over the door of the church can provide a pleasing decorative touch that everybody will notice when they arrive. Check how you will fix the garland in plenty of time before the big day. Vicars of fifteenth century churches don't take too kindly to people banging nails into their church to hold flowers up! 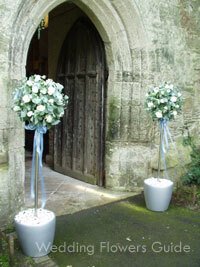 An alternative to a garland over the entrance is to place trees either side of the church entrance. I've done this on numerous occssions with great success. I've found that bay trees work well, although you could also use other ornamental trees. You could also create flower trees (sometimes called flower topiary trees), as in the photgraph on the left. You can then coordinate your flowers with the other arrangements at your wedding. One of the advantages of using trees over a door garland, is that after the ceremony you can have the trees moved to the reception. Here in the UK, many more people are getting married at civil ceremonies in licensed premises such as hotels, and sports stadiums. These rooms can often be somewhat featureless and bland. Wedding ceremony flowers can make a real difference here, and give the room a sense of celebration. 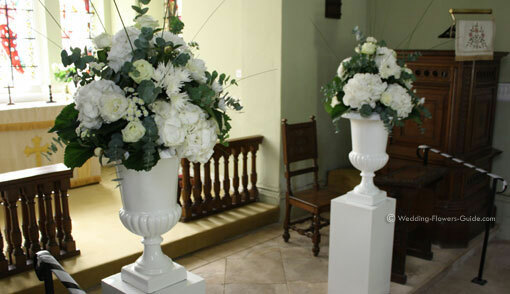 Pedestal arrangements are particularly suitable for making an impact, and adding colour. Placing one on either side of the ceremony table at the end of the room is a common way of using them. You could also place a pedestal close to the entrance door to the room (as in the photo on the left). It will be one of the first things that guests see as they enter the room. 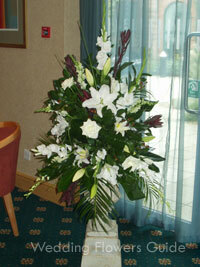 You can also place a smaller arrangement on the ceremony or registrar's table to add colour and decoration. This could be an arrangement similar to the altar flowers above, or a more traditional upright arrangement. At the wedding in the photgraph above, I created a long and low arrangement that cascaded down the front of the registrar's table. These wedding ceremony flowers were then re-used as the top table arrangement for the wedding reception. When you are planning your wedding ceremony flowers remember to continue your colour and theme through. This will co-ordinate with the bride's bouquet and reception flowers to create a stylish and seamless effect.